Before Saturday’s kick-off at Goodison, there was a sustained round of applause when representatives of the Hillsborough families took to the pitch. LEIGHTON BAINES’S FIRST goal in nearly two years gave Everton manager Roberto Martinez a much-needed victory as the Toffees beat mid-table rivals Bournemouth 2-1 in the Premier League at an emotional Goodison Park on Saturday. Everton came into the match with Martinez under pressure after a run of seven games without victory in the league was followed by last weekend’s FA Cup semi-final loss to Manchester United. 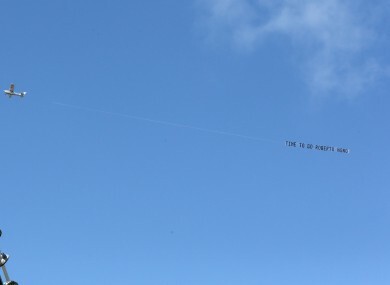 A plane carrying a banner “Time to go Roberto” flew over Goodison, the frustration of many Everton fans with their under-performing side compounded in a season where previously unheralded Leicester City are on the verge of taking the title after eclipsing the Premier League’s established elite. But there was joy for Martinez when Tom Cleverley fired Everton into a seventh-minute lead, only for Bournemouth’s Marc Pugh to equalise two minutes later. Then, against the run of play, England full-back Baines restored Everton’s lead midway through the second half with his first goal since November 2014. Nevertheless banners saying “Martinez out” were still displayed by Everton fans after full-time. This was the first match on Merseyside since an inquest jury ruled Tuesday that 96 Liverpool fans who died after being crushed during a 1989 FA Cup semi-final against Nottingham Forest at Sheffield Wednesday’s Hillsborough ground, in Britain’s worst sporting tragedy, were unlawfully killed. The campaigners applauded a crowd that included opposition Labour MP Andy Burnham, an Everton fan, who played a key role when in government in setting up the review panel whose findings led to a new round of inquests. Former Manchester United midfielder Cleverley’s shot from the edge of the box gave Everton an early lead. But Bournemouth were soon level through Pugh’s close-range strike. Everton complained that Bournemouth striker Callum Wilson had fouled Matt Pennington in the build-up, but the goal stood. In the second half, Bournemouth went close through Josh King and Matt Ritchie only for Everton to regain the lead in the 64th minute. Aaron Lennon’s cross from the right found left-back Baines on the other side of the box and his powerful shot made it 2-1. Elsewhere, West Ham United captain Mark Noble scored twice for the second game in succession as his side won 3-0 at West Bromwich Albion to replace Manchester United in fifth place. Dimitri Payet crossed for Cheikhou Kouyate to head West Ham in front in the 34th minute and Koyate set up Noble for his first goal before Andy Carroll crossed for the Englishman to volley in his second. Meanwhile, skipper Troy Deeney scored a last-gasp brace as Watford twice came from behind to inflict a 3-2 defeat on already-relegated Aston Villa. Villa led twice, through Ciaran Clark and Jordan Ayew, but Almen Abdi cancelled out Clark’s opener and after the hosts had lost Aly Cissokho to a red card for a last-man foul on Ikechi Anya, Deeney turned the game on its head. Leaders Leicester City can become England’s first new top-flight title-winners since Nottingham Forest in 1978 if they win at Manchester United on Sunday. Should they fail to win, they will still be crowned champions on Monday if second-place Tottenham Hotspur, who are seven points off the pace, cannot better their result when they visit Chelsea. Email “'Time to go Roberto' - Baines stops rot for Everton at emotional Goodison”. Feedback on “'Time to go Roberto' - Baines stops rot for Everton at emotional Goodison”.